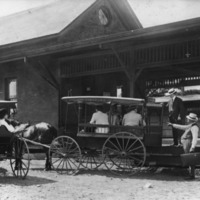 Conklin Wanser Stage at the Amityville train station. 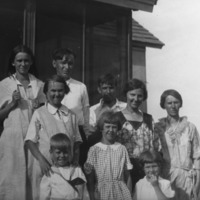 Group portrait of Mrs. Flo Corwin, Harriet Corwin, Anna Kahn, Ray Kahn, and children, standing in front of a building. 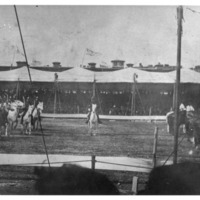 Horses performing at the Mineola Fair Grounds, possibly part of Buffalo Bill Cody's Wild West show. Exterior front view of St. Mark's Church. 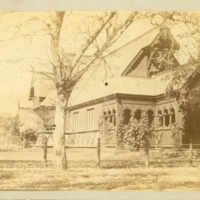 Built 1880 by architect Richard M. Hunt, funds donated by W.K. 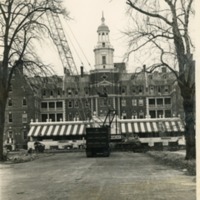 Vanderbilt. Example of Norwegian Stave design. 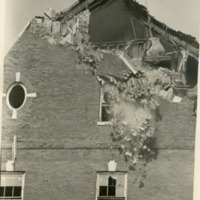 Wrecking ball demolishing a roof of the Garden City Hotel . Originally built in 1874 by architect A.T. Stewart. Famous guests include John F. Kennedy Jr., Margaret Thatcher, Charles Lindbergh. Crane and truck in front of the entrance to the Garden City Hotel. 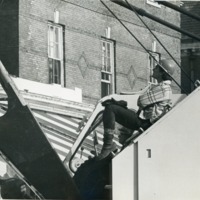 The vehicles were used during the demolition of the hotel. 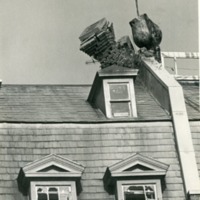 Wrecking ball knocking down a chimney on the roof during the demolition of the Garden City Hotel. 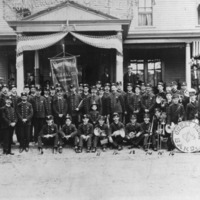 The hotel was built in 1874 by architect A.T. Stewart. Famous guests include John F. Kennedy Jr., Margaret Thatcher, Charles Lindbergh. 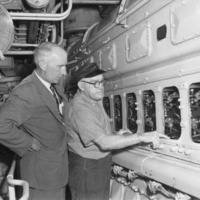 Chief Engineer Edgar Beebe and B.F. Kimball of Gulf Oil examining machinery in the engine room of the ferry "Orient"
Chief Engineer Edgar Beebe and B.F. Kimball of Gulf Oil examining machinery in the engine room of the ferry "Orient."